It's a National Postcard Swap! Welcome to Post Card Party! It’s a fun new event brought to you by the same creative team that makes the wildly popular FabricPlates™ collected during the Row by Row Experience™. But this time, it’s NOT a Shop Hop . 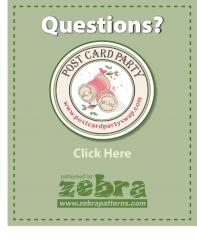 . . it's a Shop Swap with collectable postcard kits by Zebra Patterns. Post Card Parties are fun, mini workshops, you can participate in at your local quilt Shop. Sign up for a Post Card Party and learn a new technique on a small scale. Create a postcard from fabric and leave it at your store. Your card will be swapped with other cards from all over the USA. It is a great way to keep our Quilting Community Connected! Click here or START HERE!